It’s a plan for short trip to Kerala. The below plan is for 4 Nights and 5 Days trip plan. This excludes the trip to Kovalam beach though. You can also plan for that if you can add 2 more days in your trip plan. Instead of Kovalam beach we enjoyed Alleppy beach. It was quite nice and clean. The theme of this tour is to get the feeling of hill, tea garden, sea beach, backwater, wildlife and boating. Places to visit Kochi -> Munnar (2 Days) -> Thekkady (1 Day) -> Alleppy (1 Day Houseboat) -> Kochi (Day Tour) -> Back to Home. See the map below. Click to enlarge. Best season is to go between the period of October to May as the temperature of Kerala during this period remains quite moderate. However, in off-season you can also plan i.e. In the first or second week of June is the best deal on hotel up to 50% discount. You will be lucky if you get to see little rain. Rain during your house boat cruise is an amazing experience. Our car driver was saying, there are lots of people from Arab countries come to Kerala to see the rain and greenery. The nearest airport is Cohin International Airport (COK) . Or if you are coming by train then it would be Ernakulam railway station. On the same day you can proceed to Munnar approx 130 Km from Kochi about 4 hours drive (see my post on transportation plan) . Two days for Munnar is enough to see all attractions. 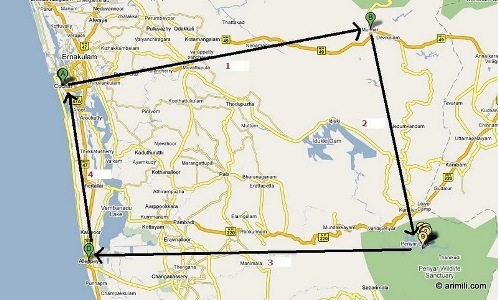 Then next morning you can start for Thekkady (Periyar Lake) which is 110 Km from Munnar , takes about 4 hours to reach. I would suggest to start from Munnar between 7 AM – 8 AM. After lunch in Thekkady visit Periyar Lake or take Elephant Ride. Next day early morning you can start for Alleppy ( As per myself, Alleppy experience is better than Kumarakom) which is approx 190 Km five hours drive. Generally, houseboat check in time is 12 noon. So try to be at the house boat on time. Once on board have lunch around 1:30 pm in the houseboat. Next morning check out from houseboat (see recommended houseboat) at 9:30 AM and proceed to the Kochi. I would recommend not staying in Kochi as there are not many places to see. You can reach Kochi in an hour which is 60 Km . Visit couple of attractions ( See the Attractions List) then proceed for the air port or the railway station. I would prefer to have the flight in the evening so that everyone can enjoy the whole day in Kochi (a.k.a Cochin). See my other posts on Kerala trip. Kerala – God’s Own Country – is the land of lagoons and palms, the land of elephants and tigers, and the land of rich cultures and traditions, and has been one of the most sought after places by travelers from all around the world.It is without doubt one of the most beautiful places on the planet and that’s why they call it ‘Gods Own Country’™. The cultural life of the people of Kerala is equally beautiful and is a major factor in attracting the tourists. Kerala offers splendid options to make your holidays an experience of a lifetime. As a reputed Tour Operator in kerala we proudly present the special packages of this beatiful land for travelers to explore and experience the wide geometry of Kerala. In Kerala, the season never ends, thanks to the year-long moderate climate and numerous festivals and events through out the year. Please Go through the different Packages & Itineraries thats suits your Budget & Convenience. With this You can experience the Kerala Backwaters, Kerala hillstations, kerala wtarefalls, kerala beaches, kerala ayurveda, kerala houseboats, kerala festivals, kerala culture, kerala spices, kerala handicrafts, kerala cuisines, kerala forests, kerala wildlife, kerala tourism, etc. From budget to luxury our prices are amongst the lowest you will find anywhere. We save your money and serve you right. ” Let us praise you ! Kerala ! Warm Paradise ! Evergreen ! Formerly known as Cochin and also called the “Queen of the Arabian Sea” this seaside town is the commercial and industrial capital of Kerala .The ride through the lagoons in Kerala style houseboats is an unforgettable experience. The famous Bolgatty Palace and The Thripunithura Palace is one of the biggest of its kind in the whole of Keralite Chinese fishing nets in the lagoons are an enchanting sight .Kochi is the only metro in central Kerala, it also gives you great opportunities for shopping also. Near by tourist places are Cherai beach ( 25 Kms), Fort kochi (10 kms), Kodanad Elephant Kraal (50 Kms), Thattekkad (60 kms). Thekkady is probably the best place in Kerala to observe wildlife and hence nature. Elephants, deer’s, boars, bison and lion tailed macaques are a common sight in the reservoir area. The tourism department offers trekking right into the heart of the forest either on foot or atop elephants. The resort located in an island in the centre of the lake is the ideal place to observe animals. Boating through the lake is a very pleasant experience and you can observe many water birds at close range. This place is ideal for wildlife photography. The best time to visit is between September and March. If you are looking for a place to relax, to relieve the tension that has built up from your workload, to just enjoy peace and silence, this is the place to be. Located close to Kuttanad ,known as the Venice of the East, with its mangrove covered lagoons and houseboats made on bamboo, serving you the most delicious Kerala food , this place just amazes any visitor. Sailing through the calm waters of Kumarakom or enjoying an Ayurvedic massage, life just slows down for you. Kumarakom is also a bird watchers’ paradise. Many different species visit this place all round the year. Alappuzha or Alleppey, with its labyrinth, of canals, bridges along silver beach, makes for a memorable holiday. Its cheerful people add to the town’s charm. Alappuzha offers enjoyable boat cruises to Kollam along the scenic Vembanad Lake. The never-ending panorama of lush green paddy fields, towering coconut trees, shimmering water and long canals around Alappuzha make a delightful setting for the town. Vagamon is a pilgrimage spot , a picnic spot and at the same time a place for adventure. Situated near the Kerala-Tamilnadu boundary, in the district of Kottayam, the main attraction of this place is the hillocks stretching over a large area, with only grass and a beautiful lake among the hillocks. This is the ideal family picnic spot. During the winter , the hillocks are covered by thick mist, so thick that you cannot see a person standing 5feet away. Being within that mist, in such beautiful landscape is an inexplicable feeling and it must be experienced. The nearby pine forests are an ideal place for romantic couples. Thiruvananthapuram ( Trivandrum ) is a must have destination for every tourist visiting Kerala , because it offers you a bunch of places of interest. Kovalam, one of the finest beaches in the whole of India, is only a half an hour ride from the city. Another wonderful beach and pilgrimage centre, Varkala is also easily accessible by road. The hill station Ponmudi,61 Km from the city ,offers you a day full of beautiful sights. The Anathapuri temple right in the heart of the city is a historic monument and is a magnificent portrait. The city is connected by air, rail and road to all Metros. Agastyakoodam (Agastya Malai), a towering forested peak of 1868 meters, and adjoining forests in the tail end of Western Ghat form the most diverse and unknown ecosystem in Peninsular India. These forests, falling in the Kollam and Thiruvananthapuram districts of Kerala and the Tirunelveli and Kanyakumari districts of Tamil Nadu harbors many endemic species of plants that are unique to peninsular India. The undulating hills of these area, especially those at lower elevations, are also known for their abundance of medicinal plants. A sizable proportion of around 2000 medicinal plants used in the traditional systems of medicine are found here. Trekking to the top of the hill. Thrissur or Trichur is famous for the Thrissur Pooram, one of the biggest festivals in the whole of India. The sight of a hundred adorned elephants on either sides of the famous Vadakkunathan Temple during the festival is a must watch scene for anyone visiting Kerala. The Guruvayoor temple located near the city is a famous pilgrimage spot. The two major waterfalls of Kerala, Athirapilly and Vazhachal, Anakkayam, 20 Kms from Chalakkudy is on the shore of the famous Chalakkudy river and the place is breathtakingly beautiful with its rushing waters, chiseled rocks and silent streams. Wayanad shows you how beautiful nature can be without human interference. The mountains, the winding lanes and the thick forests on either sides give you an ethereal experience. In the Muthanga wildlife sanctuary at the heart of Wayanad.The Edakkal caves give you paintings that are some 4000 years old. The Bamboo forests are an excellent picnic spot. For the adventurer ,trekking in Muthanga, Edakkal and Pakshipathalam can be a lifetime experience. Other places of interest are Jain temple,Meenmutty waterfalls,Kuruva islands and the Soochipara waterfalls.